Isn’t it fascinating to watch our shopping habits change year after year? It’s easier than ever to get what you want, fast. Buying gifts in-store is pretty different than it was ten years ago. You can research stores with the best deal on a pricey item you’re looking to buy your dad. Use your go-to coupon app to see which discount you can apply to it. Purchase it online and pick it up on your way home from work—all in the same day (if not hour)! The International Council of Shopping Centers (known as ICSC) has collected data from the busy Thanksgiving-to-Christmas period in 2018 to record new trends and growing statistics, categorized widely by age. We’re here to break down the numbers for you. It’s obvious that nearly everyone that shopped for holiday gifts made a purchase in a physical store this year (87% to be exact). More than half of all shoppers purchased online for some of their gifts. 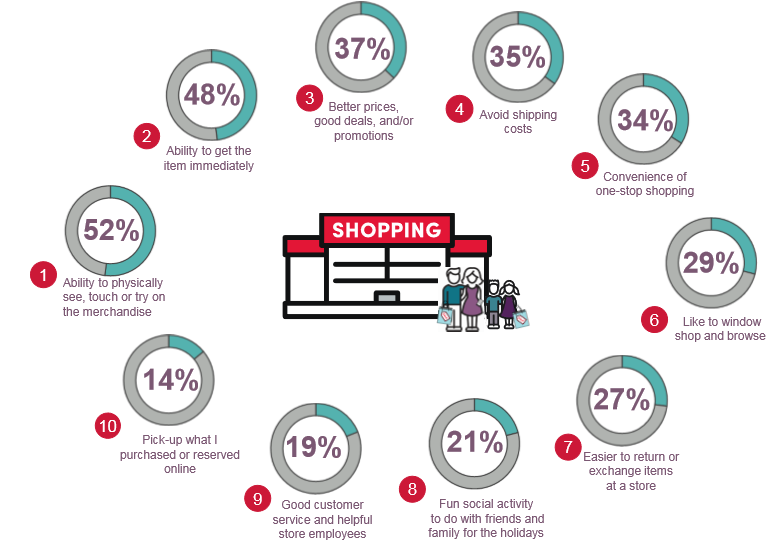 And they love being able to “buy online and pick up in-store” later that day—something that 37% of all shoppers took advantage of. You avoid the cost of shipping and get your goods the same day (and there’s no worrying if it will get lost in the delivery process). The #1 reason: we can see the item in-person. Why else? We get the item immediately; can use exclusive in-store discounts; we avoid shipping costs; and we can cross a few gifts off our list all in one stop. Consumers reported that they spent more on holiday gifts this year than last year. Why? Number one, they’re increasing the number of people they’re shopping for. No longer single like you were last year? That means you’re buying presents for your significant other, and maybe their family, too. Number two, the items are just more expensive, especially if you’re upping your gift-giving game and spoiling your family with the newest tech or pricey designer clothes. And number three, when we see an item on sale, naturally we have to get one for ourselves too, right? The research team at ICSC looked at this in terms of how much Millennials (currently aged 23-38), Gen Xers (aged 39-53), and Baby Boomers (aged 54-74) spent, on average. Gen Xers spent the most out of the three groups, with an average spend of $1,119 to get their holiday shopping done. Next were Millennials (whose bills averaged $1,053), followed by Boomers (with an average of $1,038). 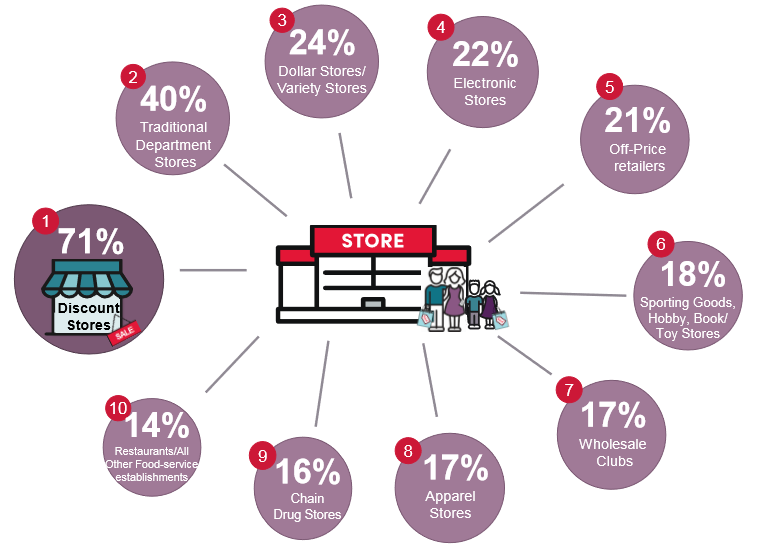 Discount stores like Walmart and Target take the cake, as 71% of all shoppers made a purchase at this type of store. It’s easy to see why: these retailers tend to sell everything under the sun, for a good price. And as we learned earlier, when you have a longer list of people to buy for, you’ll naturally be on the hunt for bargains. Secondly, we like to shop at department stores like Macy’s and Kohl’s, where we can get an Instant Pot for our mother-in-law and Nikes for our brother, all in one stop. Runner-ups included dollar stores (where 24% of people shopped), electronic stores, off-price retailers like TJ Maxx or Nordstrom Rack, and sporting goods stores. Once in these stores, 73% of shoppers used a mobile device as a resource to compare prices, look for coupons, and check inventory, compared to the 66% of people who used one in 2017. ICSC reported that 68% of all shoppers purchased a gift card over the holidays, making it the most popular gift category in 2018. Baby boomers purchased the most expensive gift cards, averaging out to $123 per gift card. Next up: apparel and shoes (which half of all shoppers bought), then toys and games at 46%. Finally, about a third of all shoppers purchased accessories and cosmetics, and foodie gifts like chocolates or pre-packaged food baskets. Do these items add up to what was on your shopping list? The retail world is a busy, profitable, and ever-changing industry, especially from Thanksgiving to Christmas. When do you plan to wrap up your list this year? 47% of people started shopping before Thanksgiving in 2018. So if your “nice” list is growing this year, it might be wise to start buying now; Black Friday will be here before we know it.